When I wrote the final post of my Year of Reading the World, back on 31 December 2012, I thought this blog was finished. As the first months of 2013 went by, however, I discovered the world had other ideas. Not only was I immersed in research about global literature for my forthcoming book, Reading the World: Confessions of a Literary Explorer, but I found myself constantly coming into contact with interesting projects and initiatives that I wanted to let you know about. The book recommendations from readers all over the planet kept coming in too (they still do to this day), so I decided to update the list every now and then to make sure that none of the excellent suggestions go to waste. But it didn’t stop there: various publishers also jumped on the band wagon, frequently emailing to ask whether they could send me books in the hope that I might blog about them. Even when I explained that I wasn’t reviewing books on this site anymore, some people still posted me their titles. Such was the case with Daniela Petracco, director of Europa Editions UK. 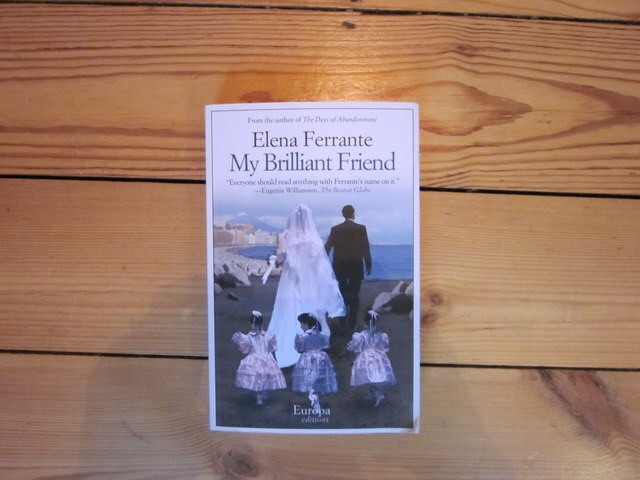 Although I told her that I wouldn’t write about Italian novelist Elena Ferrante’s My Brilliant Friend, she insisted on sending me a copy along with a glowing description of the work, so convinced was she of its power. All credit to her, because the novel might have sat on my to-read mountain for a long time had it not been for Petracco’s belief in it. Something about the way she described the story and her enthusiasm for it made it stand out in my memory so that when I came to choose my next read last week, my hand reached for it, bypassing many titles that have been waiting for weeks, months and even years. What followed was an enthralling reading experience, reminiscent of those childhood immersions in a story that turn the volume of the real world down to a whisper. It impressed and delighted me – and it was powerful enough to make me revoke my decision not to do any more book reviewing on this blog because I simply had to let you know about it (despite her success in Italy, the reclusive Ferrante is very little known in the Anglophone world – last year, the Economist declared that she ‘may be the best contemporary novelist you have never heard of’). Indeed, reading Ferrante’s novel has inspired me to introduce a regular review slot. From now on, I will choose one ‘Book of the month’ that has stood out from among the titles I’ve read (perhaps recommended by you, stumbled upon by me or sent by a passionate advocate) and publish a post on the last Tuesday of the month about it. So, without further ado, here’s a little insight into what makes My Brilliant Friend: Childhood, Adolescence such a tour de force. Charting a close friendship between two girls , Elena and Lila, growing up in an impoverished neighbourhood in 1950s Naples, this, the first volume in a trilogy, depicts the rabble of circumstances, character traits and incidents that conspire to make us dream of a better life while condemning us to be who we are. From the jealousy that steers the central characters between cruelty and fierce loyalty, at once sabotaging and supporting each other, to the bitter realities that blight the hopes of figures such as Lila’s brother, Rino – tormented by visions of a family shoemaking empire but without the focus and application to see it through – and the wretched Melina, driven mad by her love for a philandering poet, Ferrante shows us the levers working the vice that warps and crushes the human soul. Menace is everywhere. Whether in the childhood imaginings that shape the ogre-like figure of Don Achille or the all-too-real characters of the Solara brothers, terrorising the area with their Camorra connections, violence is only ever a mistimed comment away. Straitjacketed by honour codes that at once protect and hobble them, Elena and Lila must make desperate choices to have a hope of exercising some sort of control over their lives. Now and then, the narrative doesn’t hold together as tightly as it could. Ferrante gives us a few too many TV-style recaps of events and there are occasional statements that contradict what has gone before – at a wedding towards the end of the book, for example, we read that ‘it was clear no one who had received an invitation wanted to miss it’ shortly after we have just witnessed the local school teacher spurn an attempt to get her to attend. Some readers may also be frustrated by the mismatch between the prologue, set in the present day presumably some way towards the conclusion of the yet-to-be-published (in English) third book in the trilogy, and the main narrative, which only goes up until the mid-1960s. Unlike works that make up many other literary trilogies, this novel cannot really be said to stand alone. I had to laugh when I read this: Daniela Petracco has convinced me to read quite a few books I wasn’t planning to – and I haven’t regretted a single one of them! Love it. She obviously has a gift for championing books! Fantastic. So wonderful to get recs beyond the “usual.” Thanks for posting. L’amica geniale by Elena Ferrante è set in the outskirts of Naples with a crowd of minor characters. The authe friendship between two little girls following step by step their individual growth. In a continuous reversal of situations we witness to the changes of the neighbourhood, of Neaples and Italy across fifty years. My brilliant friend is an unfinished book meaning that it does not end. Other books will come and tell us about maturity and old age of these two friends. Quick question: will these books go onto “The List” for reference? Yes – when I next update it, which may be a little while! I am finding this blog to be extremely enjoyable. Thank you. Thanks Michael. Glad you like it. That’s great news Gemma. Do let me know how you get on. Thank you for including this book. Elena Ferrante is one of the most brilliant writers working today. I’ve read My Brilliant Career, the Story of a New Name, Days of Abandonment and I’m getting ready to start her latest and the third in the series those Who Leave and Those Who Stay. What I like about her books is that they are intensely, violently personal. And because of this she seems to dangle confession in front of her audience. Thanks Denise. Glad you’re a fellow Ferrante fan. ‘Intensely, violently personal’ – a very good description. An italian writer … what a pleasure! I loved this. Did you ever read the rest of the series? I’ve read the next and plan to get to the rest. My favourite Ferrante is ‘The Days of Abandonment’, though, which I read soon after this. It’s exquisite.